On September 10, 2003 the Historical Society had its annual meeting at the Squire's Tavern. President Fred Warner and committee chairmen outlined the accomplishments over the last year. A new slate of officers was nominating and elected: President- Walt Landgraf, Vice-President Shirley Coffin, Secretary- Karen Ansaldi, Treasurer- George Terwilliger, and Trustee- Doug Roberts. Following the meeting, a program highlighting several items from the Historical Society collection was presented. Refreshments were served including a birthday cake recognizing the town's 224th anniversary (Barkhamsted was incorporated as a town on September 10, 1779). 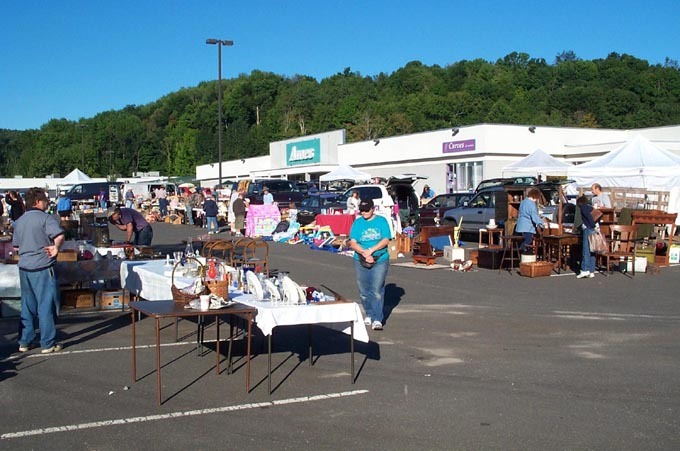 The Historical Society's main fund raising event is our flea market at Mallory Brook Plaza (a.k.a. Ames Plaza). All our volunteers come out and work hard setting up and staffing the flea market. We were very lucky this year to get in two events without being rained out- one on May 31, 2003 and another on September 6, 2003. Photo above- September 6, 2003 flea market. Look at that beautiful blue sky. This flea market was one of our best for attendance.